In search of a fun way to encourage your kids? Look no further than their school lunch. 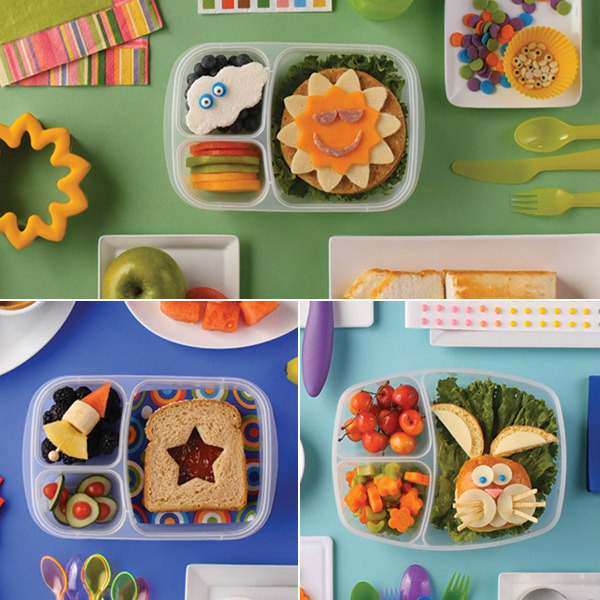 Our how-to videos will help you pack lunches that get lots of likes from all around the lunchroom. Best of all, these ideas are high in stealthily healthy ingredients, as well as kid-craveable cuteness. A school lunch that’s easy for you and good for them, too? Order up! Crown your student king or queen with this easy crown-shaped sandwich and cookie-stick scepter. A sprinkling of hearts over yogurt adds a sweet touch, and the crown fruit jewels round out the royal meal. Treat your favorite kid to a cuddly bento complete with a bunny-shaped lunchmeat-and-cheese sandwich, little cutout carrot flowers and sweet cherries for nibbling. This cheerful bento starts with two flower-shaped cookie cutters and your favorite sandwich fillings. Add a fluffy cloud of cake and a fruit rainbow to chase the gloom away and welcome the sunshine! Send this space-themed bento to school to ensure an out-of-this-world lunch hour. Peanut butter and jelly makes the center star, while on the side, an easy fruit rocket flies across a dark blueberry sky. Adorable cucumber and tomato planets round out this stellar bento!